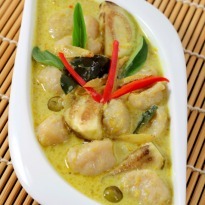 Marinate the fish cubes in half of the Thai green curry paste for 10 minutes. Add salt, pepper, and lemon juice and set aside. Heat some oil in a pan, add the onions, ginger, garlic and sweat for 2 to 3 minutes. Add the rest of the green curry paste and cook for 1 to 2 minutes. Then add the coconut milk and the fish cubes. Simmer for 2 minutes. Add the chopped cilantro and palm sugar. Garnish with basil leaves. Serve with steamed rice.